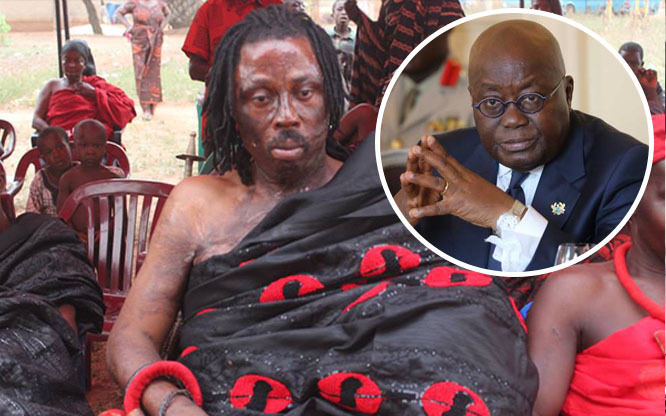 Top Chief Priest in Ghana, Nana Kwaku Bonsam has revealed in an interview with Anas that Nana Addo is actually a dwarf who escaped from his shrine some days ago. "I have been looking for him since and only saw him on Television doing some rituals. I was very surprised". The popular Chief priest also revealed that this Nana Addo is short and dark in complexion. According to the priest, the dwarf is currently in Accra and so has promised to give a huge amount to whoever helps him to find his god back. So, we are also throwing this to our readers to help this priest find his dwarf.